These eyeball-shaped gnocchi with visceral-looking fettuccine is the perfect dish for a undead appetite. It’s February, and you all know what that means – all over the world, people are anticipating that very special day that is taking place towards the middle of the month. No, not Valentine’s Day…I’m talking about the return of The Walking Dead. Whether you’re choosing to celebrate this night solo, or that special ghoul you only have eyes for, these eyeball-shaped gnocchi dumplings with visceral-looking fettuccine are the perfect dish to chow down on. Who doesn’t love eyeball pasta? 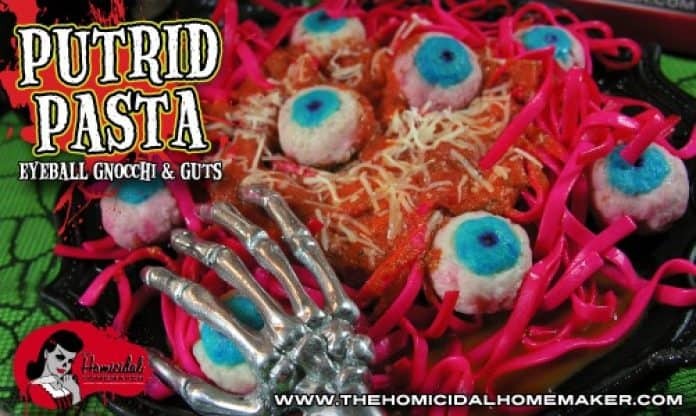 Get the recipe for my “Putrid Pasta: Eyeball Gnocchi with Guts” in my upcoming horror cookbook! Next articleUpcycle Frappuccino Bottles into DIY Vintage Milk Bottles! I NEED to know how to make this!